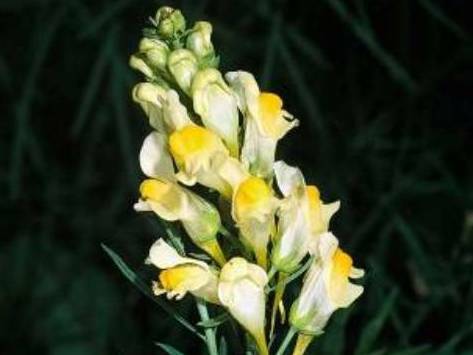 Linaria vulgaris (yellow toadflax, butter and eggs) is an herbaceous perennial (family Scrophulariaceae) that was introduced as an ornamental. It can be found in disturbed open sites, fields, pastures, degraded rangelands, roadsides, agronomic and perennial crops. Although it is typically found in northern California, it can occur sporadically in many other areas of California, except desert areas and the Big Basin. Infestations often form large colonies, displacing desirable vegetation.